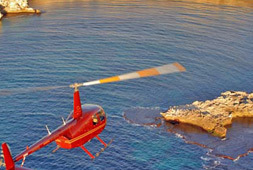 Arrive in style for lunch at Rottnest for only $540pp. (Plus $52.50 landing fee per helicopter). Fly from Jandakot airport taking in the sweeping views of historic Fremantle, the southern beaches and the sparkling turquoise waters of the Indian Ocean before arriving over Rottnest with its lighthouse, gun turrets, spectacular coastline and sheltered beaches.